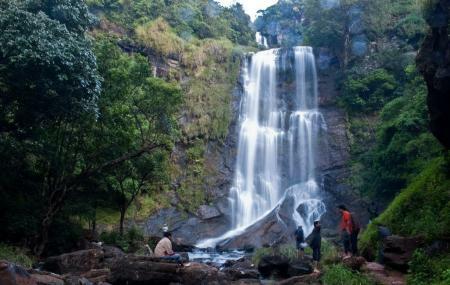 Hebbe Falls emanates from the well-known Kemmangundi Hill station of Karnataka. This forceful rapid cascading down the hills from the height of 551 ft is a breathtaking sight for the tourists. This enthralling waterfall is all the more spectacular to watch during monsoon, when the rainwaters add to the strength of the fall and makes it more potent. The trail to Hebbe Falls is a bumpy ride through the dense mountains and can be spanned by a robust four wheeler. Also, visit the popular attractions in the city by following Chikmagalur itinerary 2 days. Make sure you take a dip in this her-infused water. Early winter is considered as the best time to visit the falls. Wear appropriate shoes as the rocks tends to be slippery because of water. The falls can be visited anytime of the day. However, visiting the place during daylight is recommended. How popular is Hebbe Falls? People normally club together Mullayanagiri and Madagadakere Lake while planning their visit to Hebbe Falls. People also prefer to start their day with Hebbe Falls.